We did this tour on the only rainy day of our two weeks in France. Our guide, Amar, made the best of less than ideal conditions and kept us engaged and happy. Low cloud ceiling and unyielding rain notwithstanding, this was a day to remember for all the right reasons. 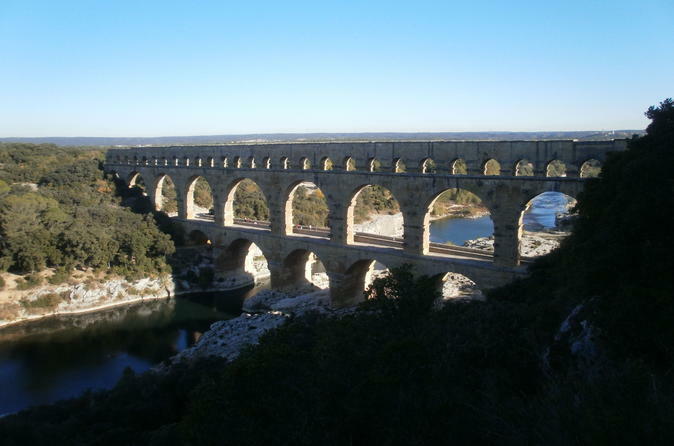 This was a great tour for someone with limited time in Provence. We saw a ton of beautiful sights and our guide, Amar, was great! This was a great tour and a nice host. There was only one topic in the agenda that was not correct. When I purchased it, it referenced the tour would include a stopover in a lavender museum. When I brought it up to the host, he said he was going to fax it over to his office. There was no lavender on the agenda since in early September the fields are no longer in bloom. There was a pitstop to look at roman ruins in St. Remy. What no one explained is literally across the street from the ruins is the hospital that Van Gogh stayed at. I think giving the group an option of either venue for 30 minutes would of been a better choice. We had a great time on our tour. The guide gave just enough time for each place. Obviously we could have stayed longer in each place but then we wouldn't be able to see as much. It was the right balance. Our driver and guide was very accommodating, checked the group constantly for our feedbacks and comfort level. He obviously is very familiar with the region and has taken us to all the historic sites and special spots for photo opportunities. It is a long day trip, but well worth the money if you don’t have a car. Will highly recommend it to other travelers alike. Take another tour , our tour guide Francios showed up 25 min late , due to traffic , Traffic is always bad so I think you need to leave earlier .He was very kind and did call and the hotel let us know he was running late. Once in the van , in was nice but we had to request air conditioner to be on. We could not hear his low tone voice in the back seat , AT ALL. The speaker system was not working . we asked about rotating seats so at least we could hear some of it . He said no the other couple had motion sickness. SO basically for the entire trip we heard nothing. Once we got to the sites he stops and says go explore and no commentary was offered . in his defense if you directly asked him a question he was very happy to answer. At a market stop he dropped us off and said pick u up at the entrance in 1 hour , we waited 20 min then I went looking for him and found him on another street , again poor communication. Loved going to the open air market , favorite stop . We asked to go to a lavender field and he made a special stop for us to see that . we had a very rushed lunch , like 45 min at a lovely stop stop on the river. so basically he drove us to the sites listed and we explored on our own . I think too many stops and not enough explaining what we were seeing .Ask about being able to hear in the van don't go unless they have a microphone system in place . The places visited were great but the guide was extremely rude and gave the one French speaker in the group extensive answers and carried on long private and personal conversations with her, while ignoring the 3 English speakers on the tour. Occasionally, she would give a brief explanation then continue her private conversation. She had no idea that 2 of the English speakers understood enough French to comprehend what was being said. We got more information from brochures and signage than from the guide. Unfortunately, we were assigned this guide for 2 tours and were stuck with her for 2 days. She was equally rude and discourteous on the other day when it was all English speakers. This tour was amazing! Highly recommend it! We were in Avignon for two days and did not feel comfortable renting a car and driving the small narrow roads but we knew we wanted to see more of the Provence region. This tour was the perfect way to do this! Our guide gave us so much information and history on each place we went to and chatted with us the whole day. 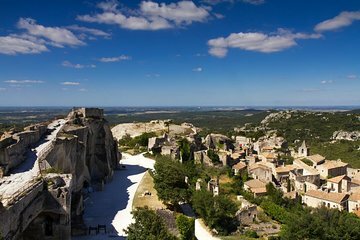 My one tip is when you get to Les Baux you do have enough time to do the castle you will just need to hustle through it as the hour goes by quick. We could have spent full days in each of the places we went to and it was a quick visit to each town but if you are short on time and can't rent a car yourself this is the perfect way to see the area and get so much insight into the Provence Region. Finishing at Pont Du Gard was perfect it was cooling down and there was a slight breeze, perfect way to end our day. You have an hour here as well but we could walk through the park at a nice leisurely pace, we did not feel rushed here at all. Go on this day trip!!! You will be happy you did! This trip was exactly as described, and covered a lot in one day! The guide Nicolas from Provence Reservations was very friendly and knowledgeable, and made sure we saw everything in the most efficient way. We even saw Provence waterfalls he could not control the weather! but that did not spoil the day overall. A great way to cover a lot of sights if you have limited time.